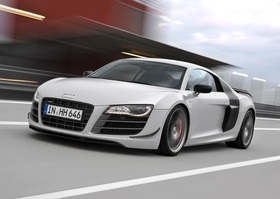 Audi's R8 GT has a more powerful engine, revised aerodynamics and carbon-fiber components that reduce its weight. BERLIN (Bloomberg) -- Volkswagen AG's Audi aims to compete on pricing with BMW AG and Daimler AG's Mercedes-Benz with the R8 GT, its most expensive model ever. The vehicle, which costs 193,000 euros ($270,000) in Germany, is part of a broader expansion of Audi's model range which may include a third sports car line in addition to the R8 and TT, Stephan Reil, development chief at Audi's Quattro sports car division, said in an interview. High-end sports cars are important to Audi because they help the automaker increase the price customers are willing to pay across the entire model range by raising the brand's overall appeal. Audi, which lags behind BMW and Mercedes in pricing power, has spent the last decade boosting its offerings. “The more Audi advances as a premium manufacturer, the less necessary will it be for them to offer lower prices,” said Sascha Heiden, senior analyst at IHS Automotive in Frankfurt. The average price Audi currently gets for a car in the United States, the largest market for luxury autos, is $43,820, or $12,630 less than Mercedes and $7,829 lower than BMW, according to automotive Web site Edmunds.com. “This car will naturally have a positive impact on the flagship Audi brand,” Reil said at the carmaker's headquarters. “We can imagine many options, you'll have to wait and be surprised,” he said of new models. Audi CEO Rupert Stadler is adding the R8 GT, which will be limited to 333 cars, four years after the R8 coupe. The new GT version has a more powerful engine, revised aerodynamics and carbon-fiber components that cut 100 kilograms (220 pounds) off the weight. Production started this month and Audi expects the car to sell out by year's end, Reil said. Audi, the biggest contributor to VW's profit, is open to adding a third sports car line positioned between the R8 and TT models, he said in an interview Oct. 14. The TT RS coupe base price is 56,150 euros (about $78,310) in Germany, while the R8 coupe starts at 109,100 euros. Audi has pledged to increase deliveries to 1.5 million vehicles and dethrone BMW as the world's largest luxury-car maker by 2015. Audi targets record sales of more than 1.08 million vehicles this year. Under Martin Winterkorn, who ran Audi before becoming VW CEO in 2007, the brand focused on increasing exclusivity by adding more luxurious interiors and sportier styling. Winterkorn also fought to regain ground in the United States, where sudden-acceleration incidents in the 1980s wiped out demand. Audi's U.S. deliveries plunged 83 percent by 1991 from their peak in 1985 of around 75,000 vehicles following recalls of the German automaker's 5000 sedan. Audi plans for the first time this year to deliver 100,000 cars in the United States. Audi has been closing the U.S. pricing gap with Mercedes and BMW helped by sales of sports cars and demand for the Q5 and Q7 sport-utility vehicles. Audi's average selling price in the country has risen 15 percent since 2002, compared with an 11 percent gain at BMW and 7 percent increase at Mercedes, according to Edmunds.com analysis. The R8 GT, Audi's most expensive serial production car, surges to 100kph (62 mph) in 3.6 seconds and has a top speed of 320 kilometers per hour, Reil said. The R8 GT and VW's Lamborghini Gallardo use the same engine block, which is built at Audi's factory in Gyor, Hungary. “The R8 GT is a near-supercar with the DNA of a Lamborghini,” said Jim Hall, principal of consulting firm 2953 Analytics in Birmingham, Michigan. Audi works closely with Lamborghini, which VW bought in 1998, making the car body for the Italian manufacturer's Gallardo. The R8 GT won't steal customers from the Gallardo because they appeal for different reasons, Reil said. Luxury carmakers have seen demand rebound this year with the global economic recovery. BMW and Daimler have raised earnings forecasts on booming sales in China and a recovery in the United States. Porsche Automobil Holding SE, which is merging with VW, this week said its most expensive serial model ever, the 237,580-euro 911 GT2 RS, is sold out. Audi is considering whether to build a five-cylinder, Quattro concept car shown at the Paris auto show last month, spokesman Eric Felber said, adding that the carmaker is awaiting feedback from potential buyers.